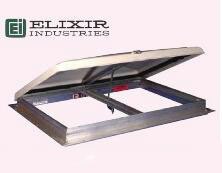 Provides an instant exit with screen that opens quickly to assure a fast exit through the opening. Features: sturdy heavy-aluminum extruded weather-tight frame, leak-resistant lid and a 4-piece metal interior garnish in a standard 2" thickness. Opaque white dome meets DOT requirements. Fits 17 3/4" x 25" cutout.